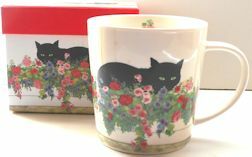 This beautiful bone china mug features a black cat sitting in a flower box. The mug is 3 7/8" high x 3 3/4" wide across the top, not including the handle. The matching fit box is 4 7.8" wide x 4" high x 4" deep. New. Note: this mug and box weigh just over 1 pound.